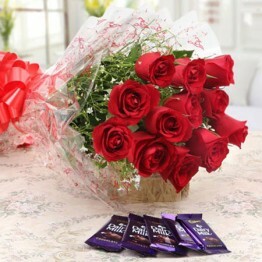 This beautiful bunch of 12 Red Roses with seasonal filler wrapped beautifully in paper packing with ..
A bunch of 12 red roses packed with 24 Dairy milk chocolates bar, gives your special one a charm..
Beautiful combination including Gladiolas, Roses, Tube Roses and green fillers (2-3 Dozen) & a 16 pi..
Order online this beautiful bunch of roses with Ferrero Rocher chocolates and bring a smile on your ..
Let your feelings which are as sweet as sugar reach out to your loved ones in Pakistan through this ..
An exquisite assortment of Christmas Love and Wishes for your loved ones. Send your wishes to your .. 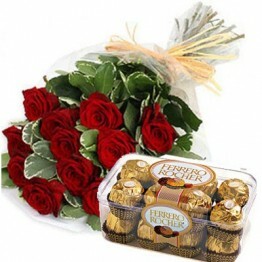 Here is a beautiful 15 Red Roses with Teddy, one delightful Cake of 2LBS and 16 Pcs Ferrero Rocher B.. If it involves gifting, chocolates and flowers are the greatest combinations. 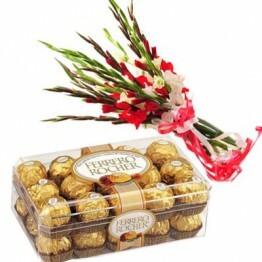 Flowers are the expressions of the heart and chocolates are also representational of love and affection. They are an evergreen much-loved of all and no matter what be the occasion a gift of flowers with chocolates would never go wrong. Both are a must at any celebration. Valentine’s Day celebrations are all about chocolates and flowers. No matter if it’s for a birthday or an anniversary celebration or as a loving gesture, this classic arrangement of flowers with chocolates is the ideal gift for your loved ones, friends and family member. Cheer everybody using our exclusive combo of flowers with chocolates they'll definitely sweep your family and friends off their feet. Our flowers are chosen fresh from our floral Shop and nutritional supplement it with our delicious chocolates. You choose our most favorite combo of flowers with chocolates will be a delightfully delicious treat savored for the duration of any occasion. 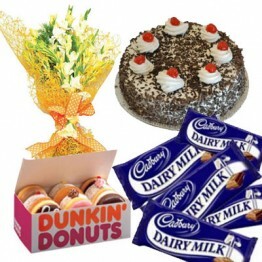 Here we are with an excellent variety of flowers, cakes, and chocolates which you’d definitely love to gift your loved ones on special functions. 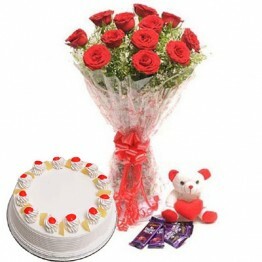 It does not matter what is a reason for the party, you can just buy flowers combos online and surely bring a smile to a face on your dear ones.